Right from the get go, this band is an attention grabber. 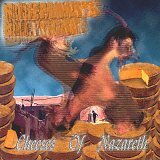 Their debut album, CHEESES OF NAZARETH, stuck in my head before I even listened to it. I mean, their album title has both shock value and humor. How can you top that? Fusing metal, punk, pop, and some rockabilly, Rosemary's Billygoat's music is quite diverse. They have a lot of strong elements, but in the end it sounds like wild, untamed metal that has more emphasis on fun than it does on structure. Their sense of humor is vivid, uplifting, and easily accessible, hitting you hard when you least expect it. "G.I. Joe Raped Barbie" is a good example of this. The chorus has a harsh garage, drunken-bar sing-along sound ringing in it, but the sheer impact this song has on the listener is enough to overwhelm anyone. I'll admit it, the title took me by storm and made me listen to this song first. The music didn't impress me, but pair up these lyrics with a band that does not know the words 'out of control,' and you're bound to have a good time. From there, the rest of the album had its moments. "Dust Bunny" contains a wicked rock-a-billy goes garage sound to it, getting you both dancing and laughing. Probably one of my favorite songs, it reeks of long nights, beer-soaked stages, and an uptight barroom crowd that needs to be woken up. Other than that, the rest of the album has a very loose, 'I don't care' feel to it. It's almost as if the band went into the studio plastered, came out with an album, and didn't know what had just happened. Too much metal and not enough focus on the quirky-ness that had me smiling and intrigued at the beginning, the rest of the disc fades off into the atmosphere without even a second though. I'll give this disc a D+.